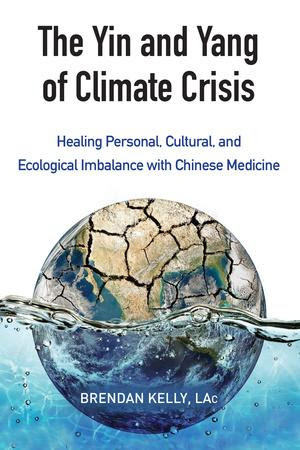 In The Yin and Yang of Climate Crisis: Healing Personal, Cultural and Ecological Imbalance with Chinese Medicine (2015), Brendon Kelly, an acupuncturist and Taichi student, draws on cases from his clinical practice based in Chinese medicine and a solid comprehension of key scientific findings about anthropomorphic global warming to come to a diagnosis of climate change as a symptom of Yin-deficient heat. “Heat,” he explains, “is an excess of warmth and a state of overstimulation, which can eventually cause our internal fluids, or coolant, to evaporate.” Kelly jumps back and forth between the levels of an individual human body, majority US culture, and planetary environmental conditions. This logic is legitimate from a Chinese medicine point of view, which holds that “the microcosm and the macrocosm reflect the same conditions and tendencies, with the only significant difference being scale.” Accepting this premise and Kelly’s diagnosis means most of us are operating with too much Yang, generating too much heat and thus contributing via our very bodies to the ecological processes of climate change. Brendan Kelly: ”The Yin and Yang of Climate Crisis“, North Atlantic Books, Berkeley, CA.